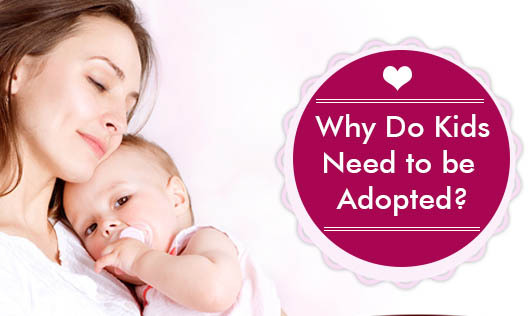 Why Do Kids Need to be Adopted? Babies are big responsibilities. You need to have enough money for the diapers, clothes, and other supplies the baby will need. A parent also must be willing to work very, very hard. Parents need to wake up in the middle of the night when the baby needs to eat. They also can't go out with their friends any time they want. Why? Because someone needs to watch the baby. And it can be hard for someone to have a baby and still be in school or college. Even if a woman is willing to care for the baby, raising a child might be very hard - or even impossible - if the woman is poor and lives in a poor country. It's a very hard choice, but some women decide their babies would have better lives if they lived with adoptive parents. Often, adoptive parents are older and better able to handle the responsibilities that come with being someone's mum or dad. In some cases, an older child may be adopted because his or her birth parents tried to take care of him or her, but did a poor job. The child may have been abused or neglected and it was decided that a new home was needed. Sometimes a child lives with a foster family for a while before being adopted. With some adoptions, the birth mother or father can stay involved in the kid's life. That doesn't mean the kid would live with the birth mum or dad, but the kid might see him or her once in a while or exchange letters or photographs. Other times, the kid doesn't get to see his or her birth parents. No matter how this works out, it can be hard to understand. Kids may feel sad about it and have a lot of questions. Don't be afraid to talk about your feelings. Talk with your parents, or if you can't do that, try another relative or even a school counselor. Kids who were adopted are no different from other kids. But if you were adopted, you might have a little more on your mind than your friends. Sometimes, learning you were adopted can make it hard for you to pay attention in school. Many kids who were adopted wonder about their birth parents and why they didn't keep them. They may wonder where they came from and what nationalities they are. They might wonder if they look like their birth parents and what their relatives are like. They might think about this stuff a lot, even if they really love their adoptive parents. You might have questions if your family includes kids who were adopted and kids who weren't. Unfortunately, someone might say that you are not your parents' "real" kid, but that is not true. Adoption makes you a real son or daughter. Again, being able to talk about your feelings can help!